Download "ON-DEMAND TRAINING FOR PROFESSIONALS REP ID : 3871"
1 FACT SHEET ON-DEMAND TRAINING FOR PROFESSIONALS REP ID : 3871 GET PMP CERTIFIED. 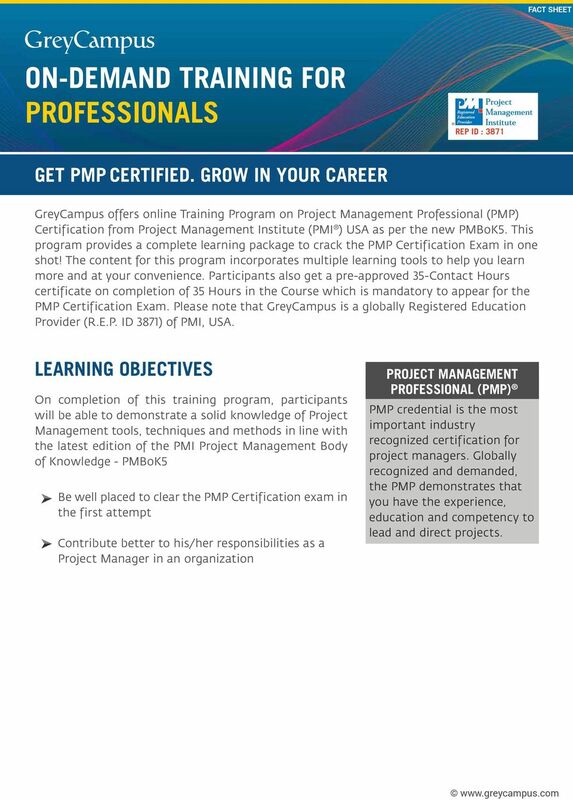 GROW IN YOUR CAREER GreyCampus offers online Training Program on Project Management Professional (PMP) Certification from Project Management Institute (PMI ) USA as per the new PMBoK5. This program provides a complete learning package to crack the PMP Certification Exam in one shot! The content for this program incorporates multiple learning tools to help you learn more and at your convenience. Participants also get a pre-approved 35-Contact Hours certificate on completion of 35 Hours in the Course which is mandatory to appear for the PMP Certification Exam. Please note that GreyCampus is a globally Registered Education Provider (R.E.P. ID 3871) of PMI, USA. LEARNING OBJECTIVES On completion of this training program, participants will be able to demonstrate a solid knowledge of Project Management tools, techniques and methods in line with the latest edition of the PMI Project Management Body of Knowledge - PMBoK5 Be well placed to clear the PMP Certification exam in the first attempt Contribute better to his/her responsibilities as a Project Manager in an organization PROJECT MANAGEMENT PROFESSIONAL (PMP) PMP credential is the most important industry recognized certification for project managers. Globally recognized and demanded, the PMP demonstrates that you have the experience, education and competency to lead and direct projects. 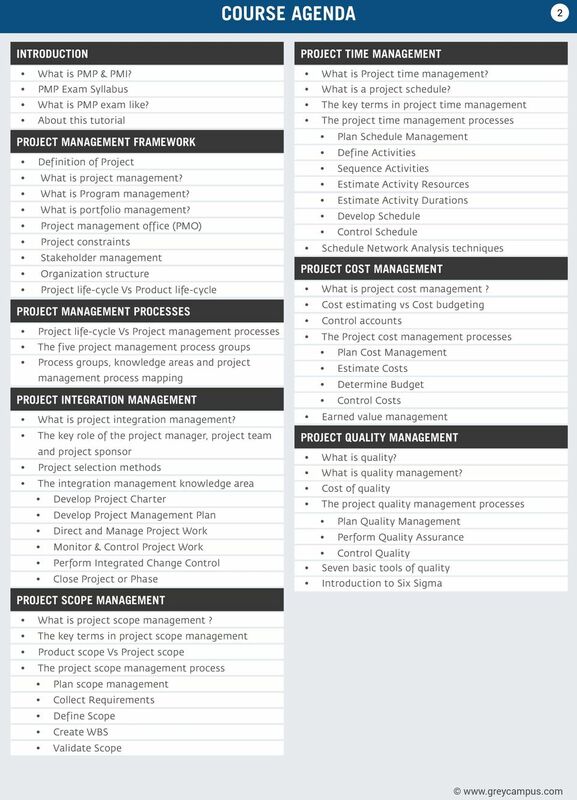 2 PMP ONLINE COURSE COURSE INCLUSION 1-Year Access 35 Contact Hours Certificate 30 Day Instructor Helpline Audio Video Lectures Simulated Exams Flashcards Tool Kits WHO SHOULD ATTEND Program Managers, Delivery Managers, Project Managers, Associate Project Managers, Project Leaders and those desirous of getting the PMP credential. Please note that the work experience should be related to areas in the PMBoK 5 and the individual should have the requisite work experience to apply for the PMP certification. However there is no restriction as to the sector in which the individual is working or has worked in. 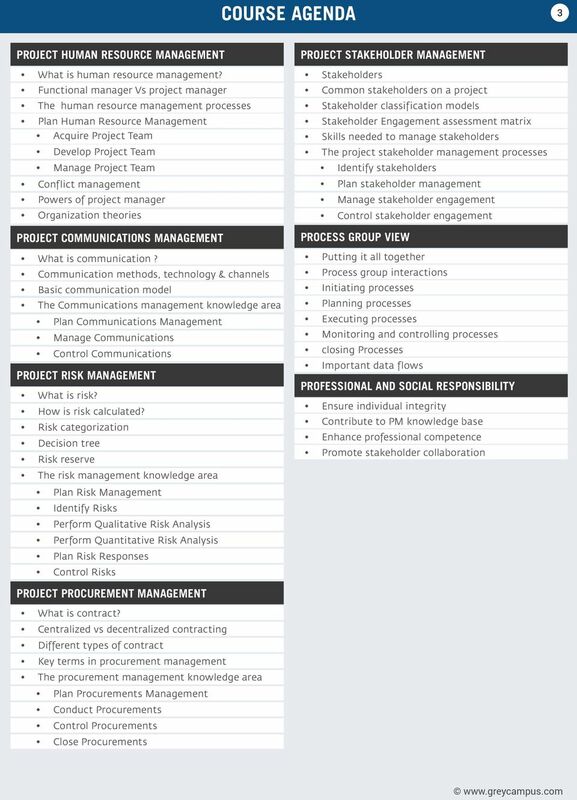 PMP recognizes demonstrated competence in leading and directing project teams. If you re an experienced project manager looking to solidify your skills, stand out to employers and maximize your earning potential, the PMP credential is the right choice for you. 5 ABOUT GREYCAMPUS GreyCampus is a leading provider of on-demand training that address the unique learning needs of professionals, delivered as online self-learning, live online training or in-person classroom training. Our aim is to provide quality training enabling professionals to achieve their certification and career enhancement goals. We offer training for certifications in areas of Big Data & Hadoop, Project Management, IT Service Management, Quality Management, Python Programming, Agile Training Coaching & Certification and Workplace Tools. 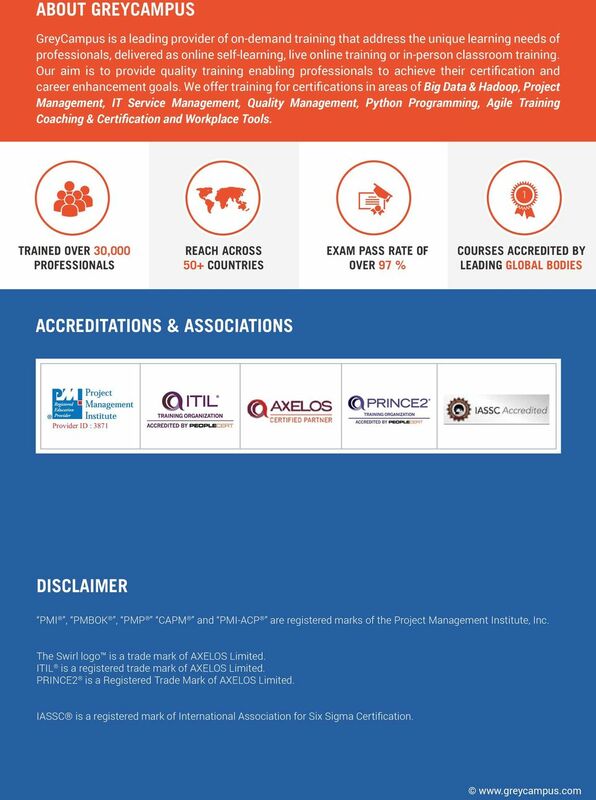 TRAINED OVER 30,000 PROFESSIONALS REACH ACROSS 50+ COUNTRIES EXAM PASS RATE OF OVER 97 % COURSES ACCREDITED BY LEADING GLOBAL BODIES ACCREDITATIONS & ASSOCIATIONS Provider ID : 3871 DISCLAIMER PMI, PMBOK, PMP CAPM and PMI-ACP are registered marks of the Project Management Institute, Inc. The Swirl logo is a trade mark of AXELOS Limited. ITIL is a registered trade mark of AXELOS Limited. PRINCE2 is a Registered Trade Mark of AXELOS Limited. IASSC is a registered mark of International Association for Six Sigma Certification. 4PM.com 3547 S. Ivanhoe St Denver, CO 80237 United States 800-942-4323 www.4pm.com. often as you need them. No limits.